Sealcoating is a liquid coal tar or asphalt-based sealer that protects asphalt and enhances its appearance. Sealcoating is not a structural repair. In order for sealcoating to do its job, any structural failures or cracks must be repaired in advance. Afterwards, the surface is swept clean, and all dirt, dust and debris are blown off with heavy-duty air blowers. 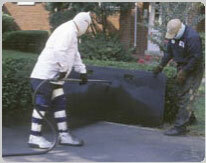 Any severe oil stains are primed with a special bonding agent to allow the sealer to adhere. Next, the sealer is spray applied to the pavement for uniform coverage. The finished result is a jet-black finish that looks great and extends the life of your asphalt. Once your parking lot has been sealcoated, we will re-stripe the parking stalls (including the appropriate handicap stalls) and help restore its curb appeal! Frequently Asked Questions about sealcoating.